Restoration and redevelopment of the quarry site will require a detailed, multi-stage process of studies, submittals, and review and comment through public agencies and the public itself. 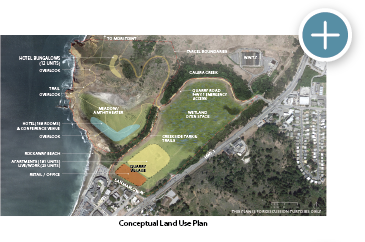 The small residential redevelopment on the site triggers Pacifica’s requirement for voter approval of the Quarry site redevlopment, ensuring the public will have strong input and final review of the plan. This website will be continually updated to provide access to all materials prepared and submitted as part of each step. Coastal erosion, as seen in this recent photograph of the quarry’s south bluff, continues to undermine the safety of popular recreational routes. 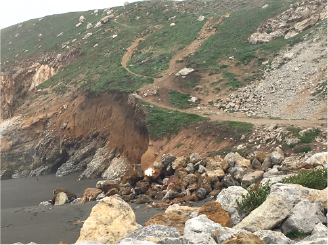 The Reclamation Plan will restore safe access trails and the quarry’s property owner recently received permission from the Coastal Commission to post signs warning of dangerous access conditions. California State law requires that all mines be reclaimed prior to formal closure and reuse. The reclamation process insures stabilization of steep, bare slopes so that erosion and sedimentation do not pollute local waterways. It also protects native plants and wildlife and provides for safe access. 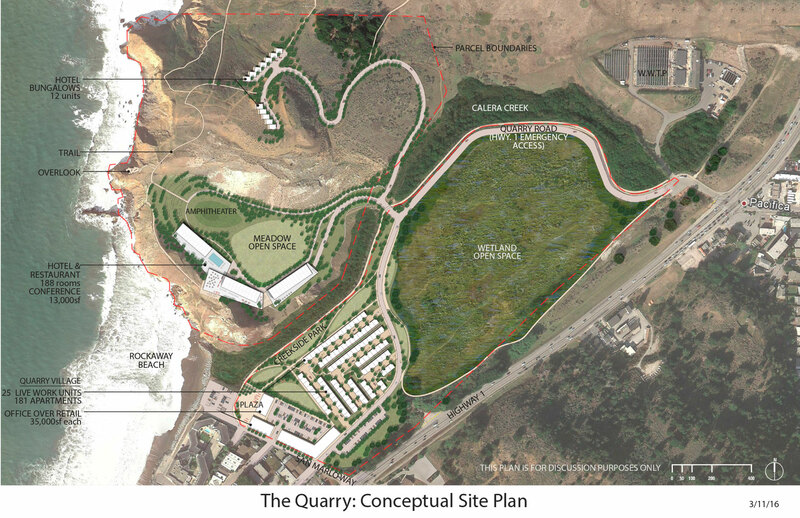 The City of Pacifica approved a Reclamation Plan for the Quarry in 1998. That plan, which was never implemented, envisioned significant grading operations at the quarry, with excavation of as much as 807,000 cubic yards of earth to meet State standards and allow additional mining of rock rip-rap for local shoreline stabilization. The 2016 Reclamation Plan (click here) meets State standards with a minimal grading program that reduces earth movement to only about 108,300 cubic yards, or13% of the 1998 proposal. The new plan avoids any additional mining and limits grading to areas with overly steep and unstable slopes, while also removing mine wastes and old fill material. Gently sculpted quarry slopes will restore the natural appearance of the coastal landscape and carve out safe access routes. Following the completion of site grading, revegetation with an approved seed mix of native grasses and groundcovers will further stabilize the soil and initiate a healthy habitat for plants and wildlife. Following implementation of the Reclamation Plan, the property owners propose a limited, balanced approach to site restoration and development that builds on the quarry’s unique location and character. 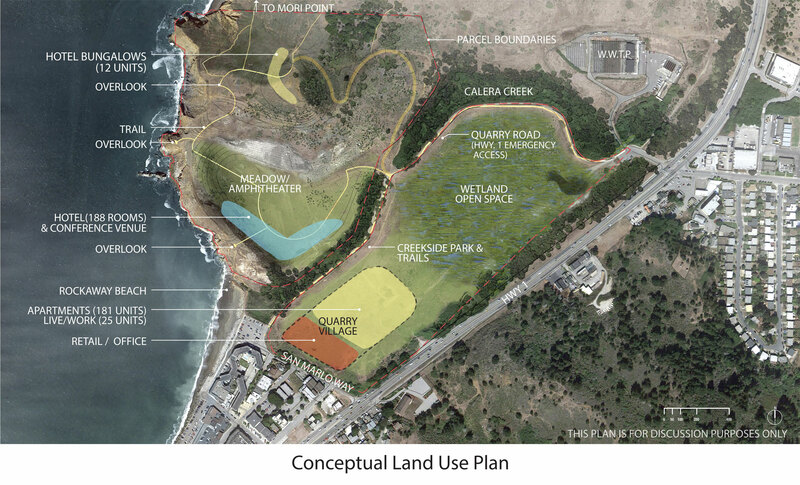 The conceptual plans shown here demonstrate the project’s strong emphasis on open space, with over 75% of the 86-acre property designated for wetland open space, a Creekside Park, an amphitheater and meadow within the quarry bowl, upgraded and safer trails, and extensive open hillside areas. The plans accomplish this by clustering development in compact, easy-on-the land footprints that respect the current community use of the site. A Creekside Park extends 100 feet into private property to separate live-work units from popular community walking routes along Calera Creek. The project’s access road, Quarry Road, will provide an emergency route parallel to Highway 1. Quarry Village: A mixed use commercial-residential village would build on the walkable street pattern and coastal orientation of the Rockaway Area with a neighborhood-serving commercial center focused on a beachfront plaza. With possibilities for cafes, shops, and a second story of office over retail, this small center would add critical mass to enliven the Rockaway neighborhood. Residents from the adjacent apartments would further activate the village setting, helping ensure the new dining and shopping options don’t fail, but remain available for all Pacifica residents. A total of about 206 residences would include approximately 25 live-work units and a healthy mix of affordable units (approximately 20% of the remaining 181 apartments), primarily one and two bedroom in size. Quarry Hotel & Conference Center: A coastal hotel of approximately 200 rooms (including 12 bungalows) would fit within the contours of the regraded quarry bowl, with a view-oriented restaurant and small conferencing facility sized to serve meetings for the hotel’s limited guestroom capacity – limiting outside traffic. The hotel would serve residents and visitors at an exciting oceanfront venue that provides substantial tax revenue to the City of Pacifica. Click image to enlarge (pdf). Click the image to download the traffic methodology report. Understanding traffic impacts of any Quarry development is an important part of reviewing any plans for the site. We wanted to give the residents of Pacifica an update on the work being done. 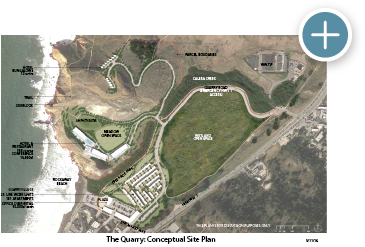 We have conducted an extensive analysis of existing traffic patterns around Pacifica and the Quarry, and we have begun to develop plans to mitigate the impacts of any potential development at the Quarry. 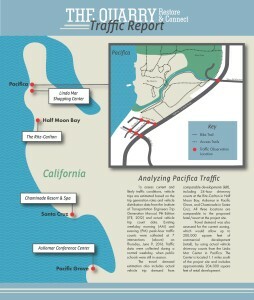 Clicking on this graphic will allow you to download a quick report on the traffic study methodology we are using. 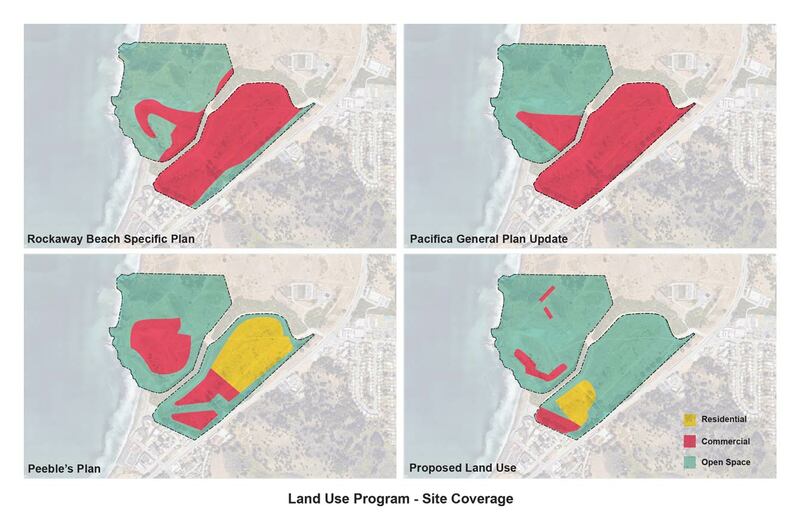 We want to assure Pacificans that we will comply with the voter-mandated requirement that any development at the Quarry mitigates any significant traffic impacts as required by the Pacifica City Council and the California Environmental Quality Act. We look forward to telling your more about our traffic mitigation plans soon.